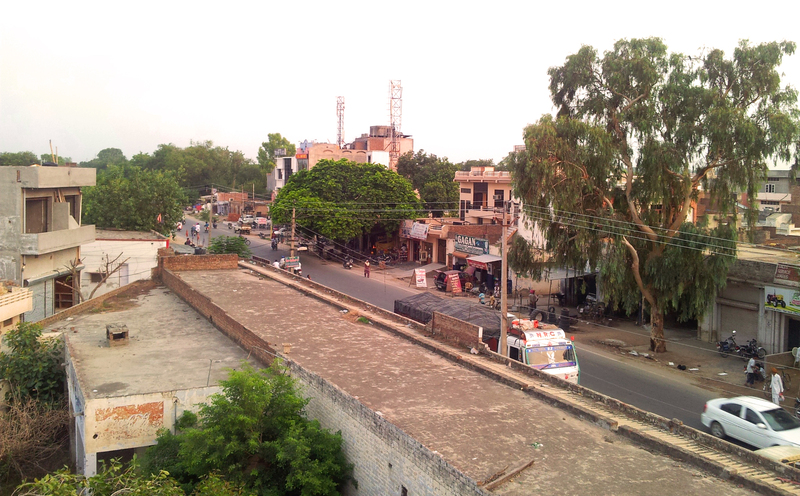 Early in the morning we pack our stuff onto our our minivans and drive off to the town of Faridkot. Taking the back streets and dirt roads around vast rice paddy fields, we got great views of the lush green landscape of Punjab during their wet season. 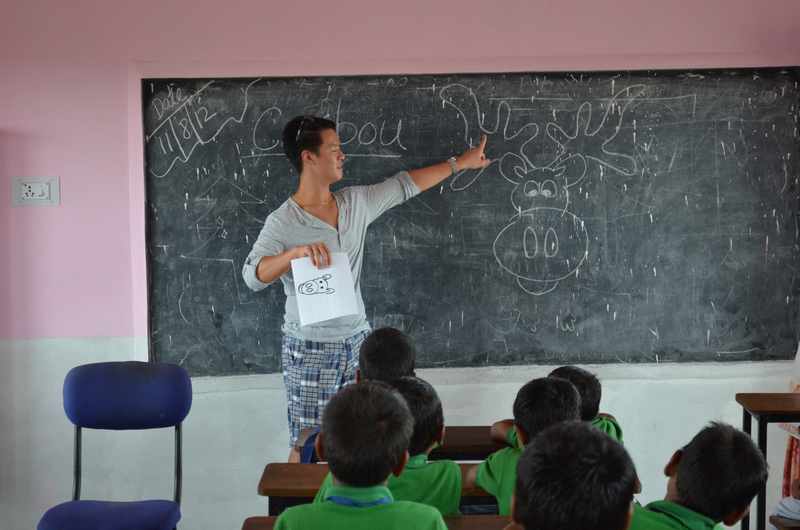 2.5 hours later, we arrive at our hotel, drop off our stuff and spend the afternoon at the Living Hope school. 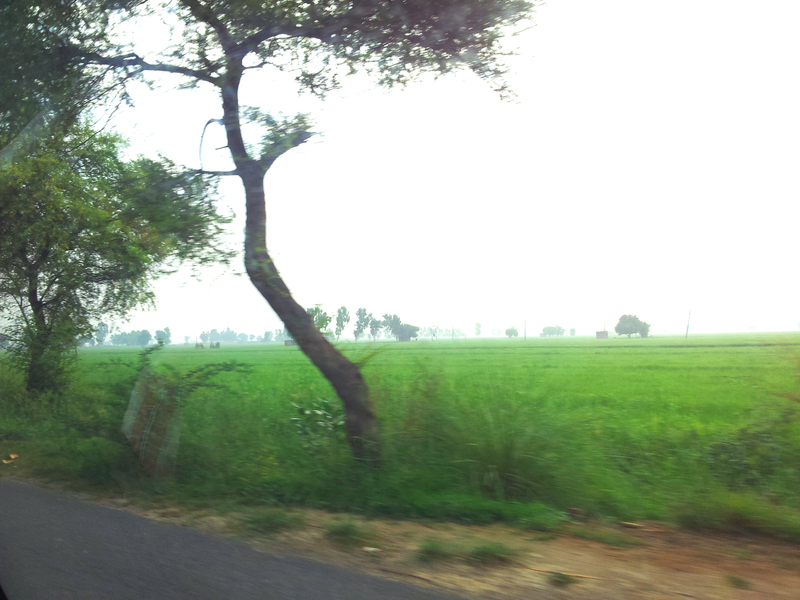 Lush green fields in Punjab. Blurry because it was taken from a car! The Living Hope school was funded by our very own church BHLC. Through months of fundraising and some generous donations, we raised $100 000 to cover the cost of the building. To see it in completion was truly a gratifying sight. The school was considerably smaller than the Good Shepard school in Abohar and the children were much younger. This made it quite a bit more difficult to communicate with them since everything had to be done through the teachers’ translation. Sam and I ran an animal station. 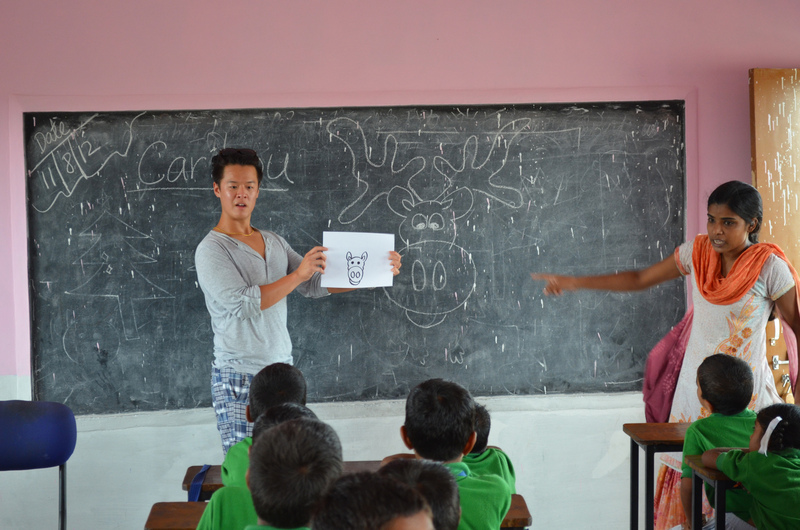 I drew caribou head templates and we got the kids to make “antlers” with paint and their hands. This worked particularly well since they had small hands and I was using regular letter sized paper haha. Each kid got a passport with their name on it and when they completed a station, they would get a stamp! I found that the kids were very needy and craved attention. Maybe this is how kids are everywhere but at times it was a bit much to handle. I’m told that around 75% of the students here are Dalits but almost all of them come from humble means. The principal, our host for Faridkot, tells us that many of the Dalit kids feel validated when we touch them (pats on the back, hugs, hi-5’s etc) since they are considered “untouchable” by the general Indian society, and we as foreigners hold an air of status about us. Untouchability was outlawed in India post independence, but in many rural towns like Faridkot, the practice is still common. Although there are laws protecting the Dalits, many are not given equal opportunities either due to prejudice, or the mere fact that few Dalits have the skills and knowledge to compete in the workforce. Dalit children are excluded from the school system and thus remain uneducated and never make it to high positions of influence, thus starting the cycle again. The Living Hope school as well as others founded by the same organization offer and English education, important to ALL Indians, that’s completely integrated. Children from all castes eat, play and learn together. The idea is that the concept of caste will be weakened and eventually forgotten through raising the next generation of children in an integrated environment. This girl is Shaina. A couple from our church sponsors her. 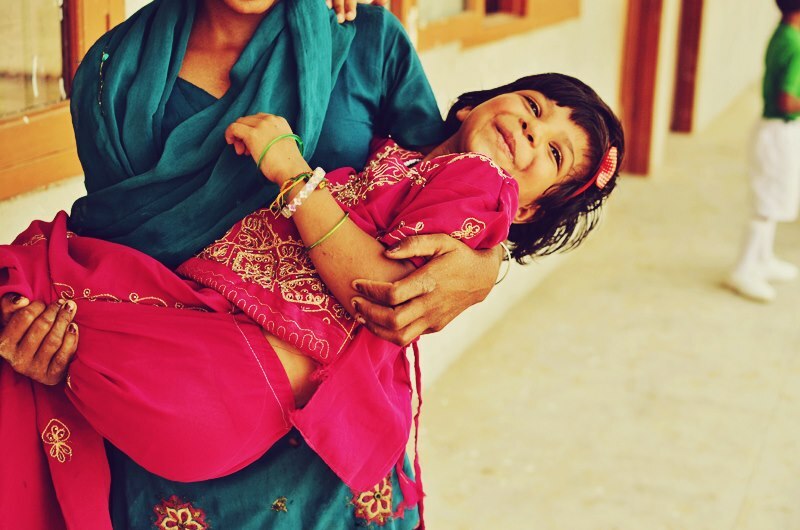 If you’re interested in sponsoring a child too (for only $25/month!) feel free to leave a comment or contact me. Let me tell you now its an amazing and rewarding experience! One of the saddest stories we heard was that of the groundskeeper. He and his family live on the school grounds in a shack across a dirt field. He was a Dalit landowner and make a living farming a humble plot of land. Skilled in farming, he was thus uneducated in math and literacy. The principal told us how he was cheated out of his land by some upper caste business people. They made an offer for the land and explained it to him verbally. His signature was his fingerprint on the contract since he was illiterate. However, amount of money agreed upon was not the amount written on the contract. Not being able to read the contract, he basically signed away his land for peanuts. It was both heartbreaking and infuriating to hear stories like this. It really emphasized the immediate need for these village children to become educated and move to positions of influence to stop this injustice. The weather was extremely hot here. Concrete rooms that heated up and rolling power outages meant no fans! I was sweating everyday and had to toss a few stained T-shirts haha. On one morning, we decided to buy a few trees from a vendor in town and plant them in the little garden in front of the school. Perhaps one day the trees will be big enough to give the kids a shaded area to play in. 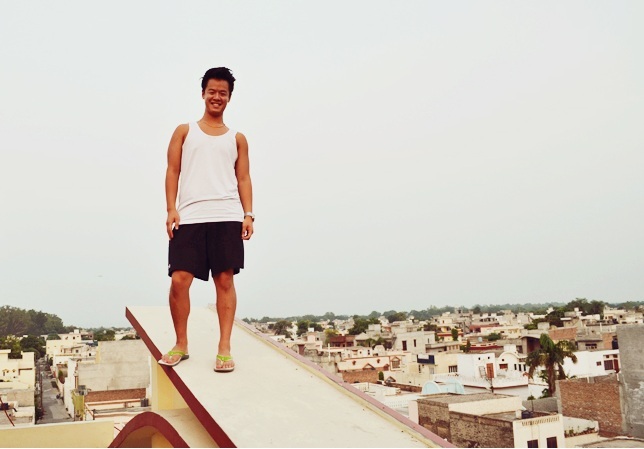 Each day was hot, tiring and incredibly fulfilling. Some friends of mine are holding a fundraiser this coming Saturday benefiting women in India. Women in India, especially Dalit women really do get the shortest end of the stick as far as opportunities go. Proceeds from the Thread of Hope Fashion Bazaar will go towards building a vocational training center in Abohar for women. Please come out and check out some of the clothes for sale!